Step one. Lift tabs in back and remove cover. Make sure you let the IIci sit for about an hour to dissipate any stored electricity. Step two. Remove power supply (that metal cube in the back). The power supply pulls straight up - it is held down by a small tab on the "pillar"of the drive bay bracket, and moves up and down along a track molded into the side of the case. Hold this tab in and pull the power supply up (pull hard!). When you reinstall it, it's hard to tell if you got it all the way down - if you hear the drive pillar tab "click", it's all the way down. Step three. Remove drive bay bracket. Remove the single screw - it fastens the "pillar" to the motherboard. 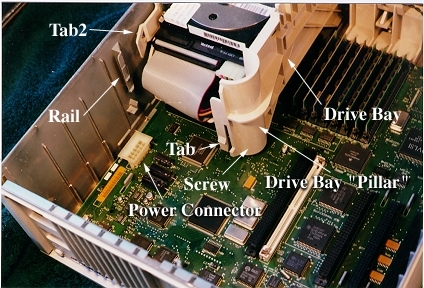 Pull out the cables connecting the drives; there are three - floppy cable, SCSI cable and hard drive power cable. The drive bay is also attached the the side of the case with a tab (tab2) - wrangle it out without scraping the FPU or ROM off the motherboard in the process! Step four. The battery is located under the drive bay bracket. The top of its holder pops out (up). Remove simms by holding the metal clasps apart and slanting the simm to the left (away from the drive bay) - a simm tool really helps. Installation is the opposite, but you don't have to worry about holding the clasps apart. When removing/installing simms or Nubus cards, make sure you discharge any static electricity on your body. If you've removed the power supply and drive bay to reach some of the simm slots (bank A), use a grounding wrist wrap (otherwise leave the computer plugged in and touch the top of the power supply). Now that you've got the power supply out, it would be a great time to clean all the dust out of it. The fan simply slides out - there's a double wire connecting it to the power supply. Wipe the dust off the fan blades and use a can of compressed air to clean out the rest of the power supply. Disclaimer: If you follow my advice, any damage you do to your computer is your fault! I've done this many times successfully, but I'm fairly handy with electronics and I'm always careful. Take standard electrical precautions and remember, you don't need a hammer or meat cleaver for this procedure.